We have previously shown that NKG2C+ NK cells from CMV naive umbilical cord blood grafts expand preferentially in recipients after CMV reactivation, representing a primary NK cell response after hematopoietic cell transplantation. In this study, recipients of adult donor hematopoietic cell transplantation were assessed to evaluate the role of donor/recipient CMV serostatus on the expression and function of NKG2C+ NK cells to determine responses to secondary CMV events. Expansion of NKG2C+ NK cells was seen following clinical CMV reactivation. However, they also expanded in the absence of detectable CMV viremia when both the donor and recipient were CMV seropositive. Upregulation of NKG2C was observed in NK cells from CMV-positive recipients receiving grafts from CMV-seropositive or -seronegative donors. These in vivo–expanded NKG2C+ NK cells had an increased capacity for target cell–induced cytokine production, expressed an inhibitory killer Ig-like receptor for self-HLA and preferentially acquired CD57. Most importantly, NKG2C+ NK cells transplanted from seropositive donors exhibit heightened function in response to a secondary CMV event compared with NKG2C+ NK cells from seronegative donors. We conclude that NKG2C+ memory-like NK cells are transplantable and require active or latent (subclinical) expression of CMV Ag in the recipient for clonal expansion of NK cells previously exposed to CMV in the donor. Natural killer cells, comprising ∼10% of all circulating lymphocytes, are important effectors in the elimination of virally infected and transformed cells. NK cells can potentially express a wide range of diverse receptors that transmit inhibitory or activating signals that ultimately regulate NK cell function (1, 2). Unlike B cells or T cells, NK cells do not express germline-rearranged receptors and instead display a variety of receptors that are clonally distributed on NK cell subpopulations, which may account for diverse NK cell functions. The best-characterized NK-associated receptors include the killer Ig-like receptors (KIR) and the C-type lectin-like families, of which both activating and inhibitory forms exist. Inhibitory KIR recognize allelic epitopes present on certain HLA-A, -B, and -C alleles (3, 4), whereas ligands for activating KIR are less well characterized. The inhibitory C-type lectin-like receptor NKG2A recognizes the nonclassical class I allele HLA-E (5), and the activating receptor NKG2C also has been shown to recognize HLA-E, albeit with lower affinity than its inhibitory counterpart (6). With these receptors, NK cells monitor changes in the expression of self-MHC class I associated with viral infection or transformation and lyse these cells, a phenomenon known as the “missing self” hypothesis (7, 8). NK cells have been shown to play a critical role in the host’s immune response to viral infections (9, 10). Infection with CMV, a herpes virus that remains latent in hosts for life, is usually asymptomatic but can be a serious complication in solid organ or hematopoietic cell transplantation recipients or for patients infected with HIV (11). CMV infection shapes the NK cell receptor repertoire, resulting in an increase in NK cells expressing NKG2C (12). This increase in NKG2C+ NK cells persists throughout life, whereas in contrast, the proportions of NK cells expressing NKG2C remains low in individuals who have never encountered CMV. NK cells expressing NKG2C have also been shown to expand following coculture with infected fibroblasts (13) and during CMV reactivation in recipients of solid organ (14) and umbilical cord blood (UCB) (15) transplantation. In addition, NKG2C+ cells expand in CMV-exposed individuals who experience acute infections with Hantavirus (16) or Chikungunya virus (17) or in those with HIV infection (18). Moreover, high percentages of NKG2C+ NK cells have been associated with lower viral loads and long-term HIV persistence without progression to AIDS (19). The mechanism by which CMV drives the expression of an NKG2C expressing subpopulation is unknown, and in the context of CMV infection, the ligand for NKG2C remains elusive. NKG2C may recognize HLA-E, HLA-E loaded with a particular CMV peptide, or an unknown ligand of either viral or host origin. We have reported that following CMV reactivation in recipients of CMV naive UCB grafts, some of the reconstituting NK cells upregulate NKG2C cell surface density and expand and they persist long after viral clearance (15). These in vivo–expanding NK cells lack NKG2A, express an inhibitory KIR specific for self-HLA, are potent producers of IFN-γ, and preferentially acquire CD57. Furthermore, recipients who reactivated CMV had increased IFN-γ and T-bet mRNA transcripts. In this setting of “new” CMV infection of transplanted UCB donor graft cells seen in UCB transplantation, it is unclear what effect donor or recipient CMV serostatus has on the kinetics and function of NK cells in recipients of adult allogeneic hematopoietic cell transplantation (HCT). We analyzed PBMCs from 70 donor and recipient pairs including allogeneic transplants facilitated by the National Marrow Donor Program or at the University of Minnesota. Twenty-five patients with hematologic malignancies received unrelated adult donor HLA-matched unmanipulated (T cell replete) bone marrow or peripheral blood stem cells (enrolled in the Blood and Marrow Transplant Clinical Trials Network Protocol 0201) using standardized cyclosporine or tacrolimus-based graft-versus-host disease prophylaxis (https://web.emmes.com/study/bmt2/protocol/0201_protocol.html). Forty-five patients received unmanipulated sibling donor grafts using similar conventional graft-versus-host disease prophylaxis. Patients were routinely monitored for CMV reactivation by standard clinical testing at each center. Twenty-two patients developed detectable CMV in the blood 19–73 d after transplant. We collected pre-HCT donor samples and recipient samples at 3 mo, 6 mo, and 1 y post-HCT. High-resolution HLA typing was performed, and NK ligand status was assigned based on Bw4, HLA-C1, and HLA-C2 group ligands. Samples were obtained after informed consent and approval from the National Marrow Donor Program and University of Minnesota Institutional Review Boards. PBMCs were isolated from each sample by density centrifugation and cryopreserved. Before analysis for production of intracellular cytokines, the thawed cells were incubated overnight at 37°C in complete media without exogenous cytokines (DMEM [Cellgro] supplemented with 20% human AB serum [Valley Biomedical], 30% Ham’s F-12 medium [Cellgro], 100 U/ml penicillin [Invitrogen], 100 U/ml streptomycin [Invitrogen], 24 μM 2-ME, 50 μM ethanolamine, 20 mg/l ascorbic acid, and 50 μg/l sodium selanate). The human erythroleukemia cell line K562 was maintained in IMDM (Invitrogen) supplemented with 10% FBS (Invitrogen) and 100 U/ml penicillin and 100 U/ml streptomycin (both Invitrogen). Intracellular production of IFN-γ was measured as reported previously (20). Briefly, PBMCs were incubated in media alone or with K562 cells at an E:T ratio of 2:1 for 5 h. Brefeldin A (BD Biosciences) was added after 1 h. The following Abs were used: PeCy5.5-conjugated anti-CD158a (clone EB6; Beckman Coulter), allophycocyanin-conjugated anti-CD158b (clone GL183; Beckman Coulter), Alexa Fluor 700-conjugated anti-KIR3DL1 (clone DX9; BioLegend), PE-conjugated anti-NKG2C (clone 134591; R&D Systems), allophycocyanin-conjugated anti-NKG2A (clone z199; Beckman Coulter), PeCy7-conjugated anti-CD56 (clone HCD56; BioLegend), FITC-conjugated anti-CD57 (clone HNK-1; BD Biosciences), energy couple dye–conjugated anti-CD3 (clone UCHT1; Beckman Coulter), allophycocyanin-Cy7–conjugated anti-CD16 (clone 3G8; BioLegend) and Pacific Blue-conjugated anti–IFN-γ (clone 4S.B3; BioLegend). Data were analyzed on a LSRII 11-color flow cytometer (BD Biosciences) and with FlowJo 9.3.2 software (Tree Star). Gating strategies are outlined in Supplemental Fig. 1. Data were summarized with mean and SE (mean ± SEM). For comparisons between independent samples, Student t test was used. For comparisons of matched samples, paired t test was used. Statistical significance was indicated as NS, p > 0.05, *p ≤ 0.05, **p < 0.01, and ***p < 0.001. Statistical analyses were performed using SAS version 9.2 (SAS Institute, Cary, NC). NKG2C expression was measured on PBMCs isolated from 70 donor/recipient pairs who received transplants from either adult unrelated adult donor or sibling fully HLA-matched donors (Fig. 1A). Each transplant was divided, based on whether recipient CMV reactivation occurred posttransplant (n = 22) regardless of the donor CMV serostatus. Those that did not reactivate CMV (n = 48) were stratified, based on the donor and recipient CMV serostatus determined pretransplant (e.g., CMV-seropositive donor/CMV-seropositive recipient [D+/R+]). There was minimal expansion of NKG2C-expressing NK cells in donor/recipient pairs who were CMV seronegative (n = 12). 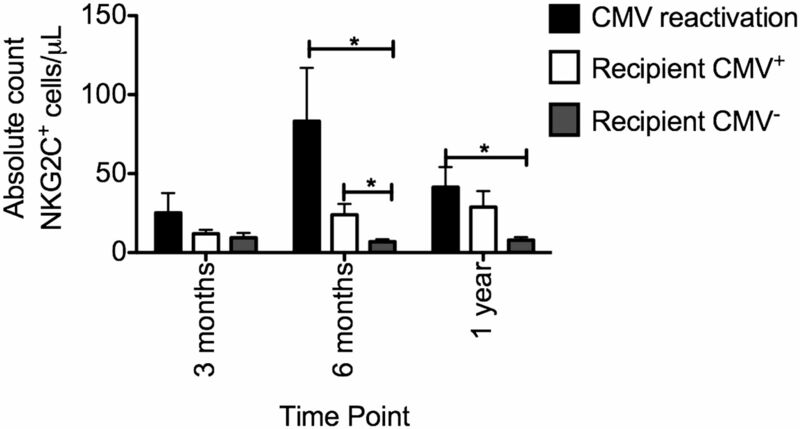 In recipients who reactivated CMV, NK cells expressing NKG2C increased significantly at 3 and 6 mo posttransplant compared with the pre-HCT donor sample (3 mo, 25 ± 4 versus 12 ± 3%, p = 0.005; 6 mo, 28 ± 4 versus 12 ± 3%, p = 0.002) and were significantly higher than the percentage of NKG2C+ NK cells in D−/R− pairs at 1 y posttransplant (CMV reactivation recipients: 23 ± 5% versus D−/R−: 6 ± 0.7%, p = 0.01). Beyond 6 mo, the percentages of NKG2C+ NK cells did not increase further. NKG2C cell surface density measured as median fluorescence intensity on gated NKG2C+ NK cells also increased over time following CMV reactivation and by 1 y posttransplant was significantly higher compared with D−/R− pairs (2088 ± 352 versus 978 ± 102; p = 0.01) (Fig. 1B). Receptor density and percentage of NKG2C+ NK cells increases following CMV reactivation or in the presence of recipient CMV Ag after allogeneic HSCT. (A) NKG2C expression was measured on CD56+CD3− NK cells from donor/recipient pairs who reactivated CMV (●, n = 22). The remaining donor (D)/recipient (R) pairs did not reactivate CMV and were stratified by CMV serostatus established prior to transplantation ([D+/R+, □, n = 18], [D−/R−, ▴, n = 12], [D+/R−, ▪, n = 8], and [D−/R+, ◇, n = 10]). Recipient samples were analyzed at 3 mo, 6 mo, and 1 y posttransplant. Points represent the mean ± SEM. D+/R+ pairs were compared with D−/R− and D+/R− using the Student t test. Statistical significance is indicated as NS: p > 0.05; *p ≤ 0.05; **p < 0.01. (B) NKG2C surface density was measured on PBMC from the donor (▪) and recipient (□) at 1 y posttransplant from donor/recipient pairs who reactivated CMV and those with no detectable CMV viremia (D+/R+, D−/R−, D+/R−, and D−/R+). Bars represent the mean ± SEM. Recipients at 1 y posttransplant were compared using the Student t test. Statistical significance is indicated as *p ≤ 0.05, **p < 0.01. The frequency of NK cells expressing NKG2C also expanded when both the donor and recipient were CMV seropositive (D+/R+, n = 18) but in the absence of detectable CMV viremia. This expansion did not occur in D+/R− pairs (n = 8), and indeed, the percentage of NK cells expressing NKG2C gradually declined in this group during the first year after transplant compared with recipients who reactivated CMV (7 ± 2 versus 23 ± 5%; p = 0.01) or in D+/R+ transplant pairs (7 ± 2 versus 29 ± 8%; p = 0.03). By 1 y posttransplant, there was a significantly higher proportion of NKG2C+ NK cells in D+/R+ transplants compared with D−/R− (29 ± 8 versus 6 ± 0.7%; p = 0.02) or D+/R− transplants, suggesting that posttransplant NKG2C+ NK cells from CMV-seropositive donors continue to persist and expand in CMV-seropositive recipients in the absence of clinically detectable CMV viremia. A modest increase in NKG2C cell surface density was observed over time in this group and was significantly higher compared with D−/R− pairs (2405 ± 370 versus 978 ± 102; p = 0.0098) at 1 y posttransplant. At 1 y posttransplant compared with D−/R− pairs, cell surface density of NKG2C was higher in recipients who reactivated CMV (920 ± 67 versus 2088 ± 352; p = 0.01) or who did not reactivate but were in the D+/R+ transplant group (920 ± 67 versus 2405 ± 370; p = 0.008). This suggests that previous CMV exposure in the recipient contributes to the expansion of these cells posttransplant and that latent CMV Ag is sufficient to provide low-level chronic stimulation to maintain expansion and a higher surface density of NKG2C. In D−/R+ pairs (n = 10) there was a modest but gradual increase in the percentage of NK cells expressing NKG2C, which did not differ significantly between D−/R− and D+/R− pairs and probably represents a weak primary NK cell response to low-level CMV. However, cell surface density did increase over time and by 1 y posttransplant was comparable (2059 ± 564) with both recipients who reactivated CMV and D+/R+ pairs, indicating that latent recipient CMV Ag does result in the upregulation of the receptor, even in cells derived from CMV-seronegative donors. In addition, not only was an increase in both the percentage of NK cells expressing NKG2C and cell surface density observed following CMV reactivation, absolute counts of NKG2C+ NK cells also increased (Fig. 2). At 6 mo post-HCT recipients who reactivated CMV or in CMV+ recipients there were significantly more absolute NKG2C+ NK cells compared with CMV-seronegative recipients. A higher proportion of NKG2C+ NK cells was also observed at 1 y posttransplant; therefore, in both recipients who reactivated CMV and seropositive recipients in the absence of detectable CMV viremia, NK cells expressing NKG2C expand and upregulate cell surface density. ), and the absolute number of NKG2C+ NK cells per microliter was calculated. Bars represent the mean ± SEM. Each group was compared using the Student t test. Statistical significance is indicated as *p ≤ 0.05. As NKG2C+ NK cells expand and upregulate surface expression following CMV viremia and in the presence of latent CMV Ag, we were next interested in the expression of KIR and NKG2A on these expanding cells. We examined NKG2A and KIR (based on a mixture of anti-CD158a/h, CD158b/j, and CD158e) expression in both groups (Fig. 3). Both in patients with CMV reactivation and in CMV-seropositive recipients expanding NKG2C+ NK cells lacked NKG2A, and there was no change in the proportion of NKG2C+ NK cells coexpressing NKG2A over time (Fig. 3A). Expanding NKG2C+ NK cells also expressed KIR, both in CMV reactivation and in recipients who were CMV seropositive with no change in the proportion of NKG2C+ NK cells lacking KIR. Because all expanding NKG2C+ NK cells express KIR, we were interested in whether individual KIR were equally represented and whether there was a preference for KIR that recognized self-HLA, which would imply that the principles of NK licensing (21) applied under these circumstances. NKG2C+ NK cells expressing CD158a, CD158b, or KIR3DL1 were divided into two groups, based on whether each KIR recognized self-HLA (Fig. 4). Both following CMV reactivation and in CMV-positive recipients, expanding NKG2C+ NK cells preferentially expressed either self-CD158a or CD158b, and the proportion of NKG2C+ NK cells expressing self-KIR3DL1 was stable during the first year after transplant. Expanding NKG2C+ NK cells express KIR and lack NKG2A. (A) NKG2C+ NK cells from donor/recipients pairs who reactivated CMV (upper panel) or from donor/recipient pairs where the recipient was CMV seropositive (lower panel) were gated as being either NKG2A+ (●) or NKG2A− (○). Points represent the mean ± SEM. NKG2A+ and NKG2A− NK cells were compared using the paired t test. Statistical significance is indicated as *p ≤ 0.05, **p < 0.01, ***p < 0.001. (B) NKG2C+ NK cells from donor/recipients pairs who reactivated CMV (upper panel) or from donor/recipient pairs where the recipient was CMV seropositive (lower panel) were gated as being either KIR+ (●) or KIR− (○) based on a mixture of anti-CD158a, anti-CD158b, and anti-KIR3DL1. Points represent the mean ± SEM. KIR+ and KIR− NK cells were compared using the paired t test. Statistical significance is indicated as *p ≤ 0.05, **p < 0.01, ***p < 0.001. Expanding NKG2C+ NK cells preferentially express KIR for self. NKG2C+ NK cells from donor/recipients pairs who reactivated CMV (A) or from donor/recipient pairs where the recipient was CMV seropositive (B) were stained with CD158a, CD158b, and KIR3DL1 and divided into self-KIR (upper panel) and non–self-KIR (lower panel), based on donor/recipient HLA class I. Points represent the mean ± SEM. NKG2C+ NK cells expressing self-CD158b and KIR3DL1 were compared at each time point and across time points using the Student t test. Statistical significance is indicated as *p ≤ 0.05, **p < 0.01. Following CMV reactivation in recipients of solid organ (14) and UCB (15) transplants, expanding NKG2C+ NK cells preferentially acquired CD57 over time, potentially representing a memory-like population of human NK cells. Furthermore, NKG2C+ NK cells frequently coexpress CD57 in healthy CMV-seropositive donors (14). CD57 expression is acquired by NK cells over time and represents a marker of NK cell maturity regardless of CMV viremia. We therefore compared the ratio of CD57+NKG2C+ to CD57+NKG2C− NK cells during the first year after HCT. In the presence of CMV Ag (either through CMV reactivation or presumed low-level viremia associated with latency in seropositive recipients) NKG2C+ NK cells preferentially acquired CD57 expression over time whereas no difference was observed in recipients who were CMV seronegative (Fig. 5). NKG2C+ preferential acquire CD57 in the presence of recipient CMV Ag or CMV reactivation. CD57 coexpression was measured on CD56+CD3−NKG2C+ (●) and NKG2C− (○) NK cells from donor/recipients pairs who reactivated CMV combined with donor/recipient pairs where the recipient was CMV seropositive (upper panel) and with donor/recipient pairs where the recipient was CMV seronegative (lower panel). The ratio of CD57+/CD57− was plotted at the indicated time points. Points represent the mean ± SEM. NKG2C+ cells were compared with NKG2C− NK cells using the paired t test. Statistical significance is indicated as *p ≤ 0.05, **p < 0.01. In recipients of HCT, target cell-induced IFN-γ production is low early after transplant (20). PBMCs from donor/recipient pairs who reactivated CMV, from CMV-positive recipients and from CMV seronegative recipients, were incubated with the class I negative cell line K562 to determine potential capacity to produce IFN-γ (Fig. 6). Both at 3 and 6 mo posttransplant, significantly more IFN-γ–producing NKG2C+ NK cells were detected in recipients who either reactivated CMV or those who were CMV-seropositive compared with CMV-seronegative recipients. Furthermore, posttransplant IFN-γ production was similar to the combined group of normal donors if the recipients reactivated CMV or were CMV seropositive. However, in the absence of documented CMV antigenemia in the recipient, NKG2C+ NK cell IFN-γ production was substantially decreased compared with donors (3 mo, 4 ± 1 versus 10 ± 1%; p = 0.01). This decrease was not specific to NKG2C+ NK cells, because total NK cell IFN-γ production was significantly decreased in CMV-seronegative recipients early after transplant compared with donor NK cells at both 3 mo (4 ± 1 versus 9 ± 1%; p = 0.0052) and 6 mo (5 ± 2 versus 9 ± 1%; p = 0.04). Collectively, these data demonstrate that exposure to recipient CMV Ag posttransplant, both in the context of CMV reactivation and latency, shapes NK cell immune responses to favor robust IFN-γ production.
) were incubated in either media alone (data not shown) or with the class I negative cell line K562 for 5 h. Intracellular production of IFN-γ was measured on NKG2C+ NK cells. Bars represent the mean ± SEM. Each group was compared using the Student t test. Statistical significance is indicated as *p ≤ 0.05, **p < 0.01. Expansion of educated NKG2C+ NK cells following CMV reactivation with potent function and their continued persistence in the presence of Ag suggest that NK cells may exhibit memory-like properties, a characteristic usually restricted to adaptive immune responses. To address this, we compared the kinetics of NKG2C+ NK cell expansion and function following CMV reactivation based on donor CMV serostatus (Fig. 7). Although the proportion of NK cells expressing NKG2C was higher in recipients who received a seropositive donor graft, the kinetics of NKG2C+ NK cell expansion was similar between the two groups. NKG2C+ NK cells from seropositive donors had a significantly higher capacity for target cell–induced IFN-γ compared with seronegative donors (16 ± 3 versus 8 ± 2%; p = 0.04). This higher capacity to produce IFN-γ was maintained posttransplant and at 1 y, NKG2C+ NK cells from a seropositive donor graft produced significantly more IFN-γ (20 ± 1 versus 9 ± 2%; p = 0.008). These results suggest that NKG2C+ NK cells transplanted from a seropositive donor expand and maintain their high capacity to produce IFN-γ posttransplant and exhibit heightened function in response to a secondary CMV reactivation (the first event being in the donor) compared with NKG2C+ NK cells from seronegative donors experiencing primary CMV viremia, where the NK cell response is the first exposure. Following CMV reactivation NKG2C+ NK cells from CMV-seropositive donors have increased capacity to produce IFN-γ. (A) NKG2C expression was measured on donor/recipient pairs who reactivated CMV were divided, based on donor CMV serostatus (donor CMV+, ●, n = 6; donor CMV−, ○, n = 12). Points represent the mean ± SEM. (B) Intracellular IFN-γ production was measured on NKG2C+ NK cells from donor/recipient pairs who reactivated CMV divided, based on donor CMV serostatus (donor CMV+, ▪; donor CMV−, □) after 5-h incubation with K562 cells. Bars represent the mean ± SEM. CMV+ donors were compared with CMV− donors using the Student t test. Statistical significance is indicated as *p ≤ 0.05, **p < 0.01. NKG2C+ NK cells expressing an inhibitory KIR for self preferentially expand following CMV reactivation in recipients of adult donor allogeneic HCT. These NK cells have a high capacity for target cell–induced IFN-γ production and preferentially acquire CD57 over time. NKG2C+ NK cells also expand in the absence of clinically detectable CMV viremia if both the donor and recipient were CMV seropositive. In contrast, NKG2C+ cells do not account for a significant fraction of NK cells if they are transferred from a CMV-seropositive donor to a CMV-seronegative recipient. Collectively, these results demonstrate that in recipients of allogeneic HCT, latent CMV Ag is required for clonal expansion and maintenance of memory-like NKG2C+ NK cells. The receptor profile, function, and kinetics of NKG2C+ NK cells following CMV reactivation in recipients of adult grafts is similar to recipients of UCB grafts with a few important exceptions. We reported that NKG2C+ NK cells continued to persist in recipients of UCB HCT long after viral clearance (15). In contrast, in this study using adult donor grafts, high proportions of NK cells expressing NKG2C peaked early. This is reminiscent of the response of Ly49H+ NK cells that expand in mice infected with murine CMV (22) and those that respond after adoptive transfer and secondary CMV exposure. Because UCB is considered CMV naive, CMV reactivation represents a primary infection from the perspective of the donor immune response. 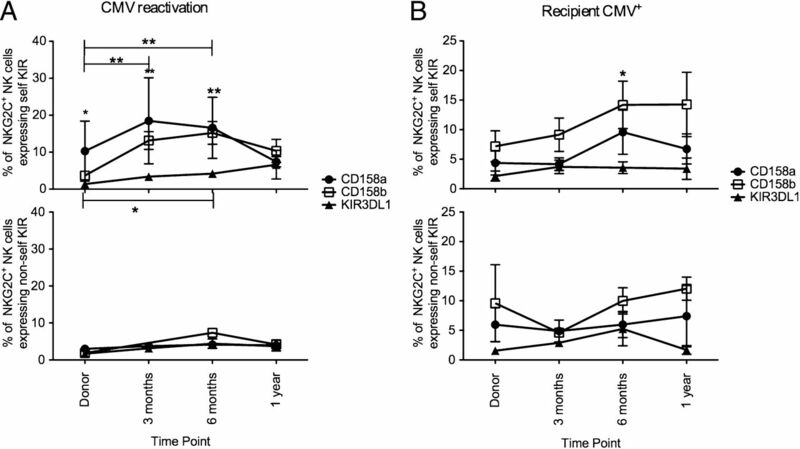 In contrast, following transplantation using adult grafts containing mature NK cells from CMV-seropositive donors, posttransplant CMV reactivation represents a secondary expansion of CMV-primed NK memory-like cells. Despite the differences in kinetics between UCB and adult donor HCT recipients, expanding NKG2C+ NK cells always lacked NKG2A and all expressed KIR. This KIR was specific for a self-HLA, either C1 or C2, and there was very little expansion of cells expressing KIR3DL1 in Bw4-expressing recipients. This oligoclonal-like expansion of NK cells expressing an inhibitory receptor for self–HLA-C has also been observed during acute infection with Hantavirus (16) and Chikungunya virus (17) with preferential expansion of KIR recognizing C1 (KIR2DL2 and KIR2DL3). Similar to what was observed in healthy CMV-seropositive individuals (14), a higher proportion of NKG2C+ NK cells express CD57, a marker of terminally differentiated NK cells, than NKG2C− NK cells following CMV reactivation. The preferential acquisition of CD57 on NK cells expressing NKG2C following CMV reactivation suggests that NK cell activation through exposure to viral Ag may drive NK cell differentiation. Overall target cell–induced IFN-γ production was increased significantly following CMV reactivation compared with seronegative recipients and in the absence of CMV reactivation, CMV-seropositive recipients had a higher capacity for target cell–induced IFN-γ production, regardless of donor serostatus. This suggests that latent CMV Ag or low-level chronic activation results in the clonal expansion and persistence of NKG2C+ NK cells that produce IFN-γ. These cells persist for up to a year clearly demonstrating that at least some NK cells are long-lived. NKG2C expression is uniquely associated with CMV, and CMV is the only virus known to date that shapes the human NK cell receptor repertoire (12). Not only does acute CMV infection result in the expansion of NK cells expressing NKG2C, it also induces an upregulation in cell surface density of the receptor. Coculture with infected fibroblasts also results in the expansion of NKG2C+ NK cells (13). Our results demonstrate that NKG2C+ NK cells from CMV-seropositive donors also expand posttransplant in the absence of clinically detectable CMV viremia, but only when the recipient was also CMV seropositive and there was a source of latent Ag. Furthermore, recipient CMV Ag was required to induce the upregulation of NKG2C on NK cells from seronegative donors. These findings suggest that CMV is required to maintain NKG2C expression, and in the absence of CMV, NK cells may downregulate their expression of NKG2C and/or fail to expand. How CMV is involved in regulating NKG2C expression still remains unknown. HLA-E is the cognate ligand for NKG2C, and although CMV infection results in the downregulation of class I HLA, HLA-E usually remains intact on the cell surface (23, 24). NKG2C+ NK cells have also been shown to expand in culture with cell lines transfected with HLA-E and IL-15 (16), yet no direct correlation between CMV, HLA-E, and NKG2C has been demonstrated. Infected cells may express HLA-E loaded with a viral peptide that drives NKG2C expansion, or alternatively, CMV-infected cells may encode a viral protein that binds to NKG2C. CMV remains latent in the host for life and chronic low-level levels of CMV may continually stimulate NK cells to express NKG2C. Alternatively, latently infected cells may constitutively express a ligand or present a viral peptide that regulates NKG2C expression. All of these possibilities warrant further study. During acute CMV infection in mice, NK cells expressing the activating receptor Ly49H preferentially expand and respond more rapidly against subsequent challenges with CMV compared with naive Ly49H+ NK cells (22). These findings suggest that NK cells are capable of immune memory, akin to memory CD8+ T cells. We find that NK cells expressing NKG2C may represent memory-like NK cells in humans. Although primary CMV infection increases the capacity for cytokine production, which is maintained long after viral clearance, subsequent exposure to CMV further increases this capacity. This suggests that NKG2C+ NK cells have memory-like properties that retain their phenotype and function after transplantation into CMV naive or seropositive recipients. Although we see an expansion in both the percentage of NK cells expressing NKG2C and the absolute number of these cells, it still remains unclear what role these cells play in controlling CMV reactivation and viremia because CMV reactivation remains a common occurrence following HSCT. However, although not specifically investigating NK cell responses, Zhou et al. (25) demonstrated that D+/R+ transplants required less antiviral therapy then D−/R+ transplants, which correlated with a more robust CD8+ T cell response. In addition, patients with chronic lymphocytic leukemia treated with the NK and T cell pan-lymphodepleting Ab Alemtuzumab (anti-CD52) develop an unexpected CMV reactivation (26, 27). These findings suggest that the immune response can modulate CMV, but other factors such as antiviral therapy need to be taken into consideration. It is quite possible that perhaps these NKG2C+ NK cells do not necessarily play an important role in controlling CMV replication in the blood (which is what is routinely measured to determine CMV reactivation) but play a larger role in controlling the CMV disease in peripheral tissues that can be lethal. Further studies investigating the role of NK cell responses in recurrent CMV reactivation and in CMV disease are certainly warranted. As the first cells to reconstitute following HCT, NK cells play a critical role in mediating the graft versus leukemia effect. However, NK cell functional responses are diminished early after transplant across all platforms of allogeneic HCT, with the greatest defects seen in target cell–induced IFN-γ production (20). IFN-γ has been shown to play a critical role in tumor suppression (28–30) and in the control of viral infections (31). Therefore, strategies to enhance NK cell function post-HCT could be therapeutically advantageous. We have demonstrated that transfer of mature NK cells in the graft exhibit memory-like properties capable of enhanced responsiveness to subsequent CMV challenge. This CMV challenge is seen with high viral loads as seen with CMV viremia but also the low Ag load that persists in recipients with latent CMV. In contrast, high viral loads are needed to induce an NK cell response from a CMV-negative donor. Using a unique cohort of allogeneic transplant samples, we have been able to show innate NK cell memory based on a secondary challenge in the recipient, the primary infection occurring in the adult transplant donor at some distant time from transplantation. We suggest that the term memory be reserved for cells that clonally expand upon secondary challenge with a minimum of at least one enhanced function, in our case IFN-γ, and that human NK cells exhibit long-term memory for potent immunologic viruses such as CMV. Selecting donor and recipient pairs, which can allow transplantation of highly differentiated potent and functionally educated NK cells, may be a beneficial strategy to increase the anti-infective and graft-versus-leukemia effect after allogeneic HCT, a strategy that will require clinical testing. We thank the Translational Therapy Core for sample procurement and cell processing services. We also thank the protocol committee and participants for collection of samples on the Clinical Trials Network 0201 clinical transplant study. This work was supported in part by National Institutes of Health Grants P01-CA65493, P01-CA111412, and P30-CA77598, the National Marrow Donor Program, and the Minnesota Masonic Charities. Support for the Clinical Trials Network study was provided by Grant U10HL069294 from the National Heart, Lung, and Blood Institute and the National Cancer Institute.
. 2006. Activation, coactivation, and costimulation of resting human natural killer cells. Immunol. Rev. 214: 73–91.
. 1999. Kinetics and peptide dependency of the binding of the inhibitory NK receptor CD94/NKG2-A and the activating receptor CD94/NKG2-C to HLA-E. EMBO J. 18: 4250–4260.
. 1986. Selective rejection of H-2‑deficient lymphoma variants suggests alternative immune defence strategy. Nature 319: 675–678.
. 2011. Expansion of a unique CD57+NKG2Chi natural killer cell subset during acute human cytomegalovirus infection. Proc. Natl. Acad. Sci. USA 108: 14725–14732.
. 2012. NKG2C deletion is a risk factor of HIV infection. AIDS Res. Hum. Retroviruses 28: 844‑851.
. 2011. NK cell education after allogeneic transplantation: dissociation between recovery of cytokine-producing and cytotoxic functions. Blood 118: 2784–2792.
. 2003. Differential effects of US2, US6 and US11 human cytomegalovirus proteins on HLA class Ia and HLA-E expression: impact on target susceptibility to NK cell subsets. Eur. J. Immunol. 33: 2744–2754.
. 2009. Impact of donor CMV status on viral infection and reconstitution of multifunction CMV-specific T cells in CMV-positive transplant recipients. Blood 113: 6465–6476.
. 2002. Phase II trial of subcutaneous anti-CD52 monoclonal antibody alemtuzumab (Campath-1H) as first-line treatment for patients with B-cell chronic lymphocytic leukemia (B-CLL). Blood 100: 768–773.
. 2007. Alemtuzumab compared with chlorambucil as first-line therapy for chronic lymphocytic leukemia. J. Clin. Oncol. 25: 5616–5623.
. 2002. The roles of IFN γ in protection against tumor development and cancer immunoediting. Cytokine Growth Factor Rev. 13: 95–109.
. 2001. IFNγ and lymphocytes prevent primary tumour development and shape tumour immunogenicity. Nature 410: 1107–1111.
. 2002. New aspects of natural-killer-cell surveillance and therapy of cancer. Nat. Rev. Cancer 2: 850–861.